Welcome to Becky’s Barn, just north of Auburn, Illinois. Kathy Weiser-Alexander. 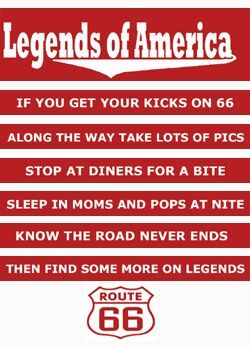 After leaving Chatham, Route 66 travelers will continue south watching for Snell Road to access historic alignments of old Route 66. At 5029 Snell Road is Becky’s Barn, a Route 66 snack shop, information center, and antique store. 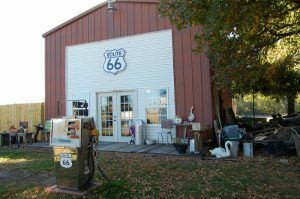 They have a unique collection of antiques and collectibles as well as a recreated vintage-style snack shop, and interesting Route 66 memorabilia. Be sure to sign their guest book during your visit, which is known as the “cool bus,” — yes, a real bus, where you sign your name on the inside. Just in front of Becky’s Barn is the bypassed brick portion of old Route 4 that is listed in the National Register of Historic Places. 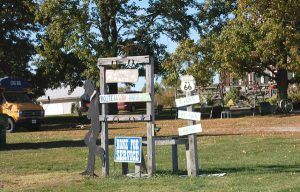 This segment includes well-preserved examples of Route 66’s early years in Illinois, illustrating early highway era construction methods, serving as part of Route 66 until 1930, when the realignment of the Route 66 south of Springfield rerouted traffic to the less populated eastern side through Litchfield in order to speed up the flow of traffic by avoiding as many towns as possible. Brick Road Route 66 north of Auburn, Illinois. Click for prints & products. After Route 66 was realigned in 1930, this section briefly reverted to its State Route 4 designation before being abandoned in a 1932 relocation of the State road. About 1.5 miles of the section, known as the Auburn Brick Road, was incorporated into the 1932 modifications and resurfaced with brick at the same time. To reach this portion of historic Route 66, travel south on Highway 4 from Chatham to Snell Road and turn west. 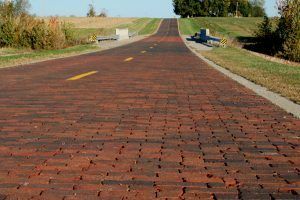 The Auburn Brick Road is located between Chatham and Auburn on Snell and Curran Roads before rejoining Highway 4. For die hard 66’er’s, Jim Ross of Ghost Town Press points out that that the original concrete pavement actually crossed existing Highway 4 at Snell Road, curving north, and if you turn east instead of West at Snell, you can still see a surviving strip of 66 at these coordinates (39.618656, -89.736675). He says there is also still evidence of where the new 1932 alignment curved onto Snell Road here (39.618376, -89.739269). After viewing this historic section, return to Route 4 and continue south into Auburn. Located in the extreme southern portion of Sangamon County, the area was first settled in 1818 by Jacob Ellis, James Black, Samuel Vancil, John Wallace, and others, all establishing farms within the vicinity. The first grist mill was built by James Sims and a water mill by Robert Crow on Sugar Creek in 1825. The following year, a tan-yard was established in 1826 by James Patton. Later, a second water mill, which served as both a saw and grist mill, was built by Jacob Rauch. Unfortunately, these mills are long gone today. The first school was established in 1828, made of logs. Situated on the property of James Patton, it was known as the Patton School House. The first church was built by the Presbyterians in 1835, a modest frame structure. Later, it was moved to the village of Auburn and used as a home. The first village of Auburn was laid out in 1835 by brothers, Asa and George Eastman, who had accumulated land all along Sugar Creek. Pleasantly located on the east half of section three at a high elevation, it commanded a fine view. It was named by their sister Hannah, for their home town of Auburn, Maine. The Eastman brothers then built a steam-powered flour mill and the Sugar Creek Tan yard the next year. Though the town was heavily promoted, by 1840, the village contained only about six houses and a handful of residents. However, it did contain a two-story tavern, owned by a man named William S. Swaney, who had bought several lots in the fledgling city. Swaney, a blacksmith by profession, rented space to another man named John Smith for a blacksmith shop on the ground level. An Ohio man with a large family, Swaney was often absent for weeks at a time and it was rumored that he was a professional gambler. Traveling along in a fancy two-horse carriage, he was said to have “worked” the Illinois River towns, plying his profession. With the neighborhood already abuzz with speculation about his mysterious journeys, the gossip became really rampant when he failed to return in 1843. When his wife confirmed that a dead man was her husband, the town rumors were found to have been true. Evidently, Swaney had been killed by a disgruntled loser, who had taken his revenge and his money back from the gambler. Auburn also sported a small nursery, from which fruit trees were dispensed to the farmers of the neighborhood, and a cabinet shop. But the Eastman brothers’ project to develop the new town was a failure, and they closed their mill in Auburn and moved to Springfield in 1841. However, the town continued on, primarily because of location of a stage stop on the stage line from St. Louis, Missouri to Springfield, Illinois and the Sugar Creek Post Office, which had been established in Auburn in 1839. When the Alton & Sangamon Railroad announced that it would build tracks through the area, small Auburn felt sure it was destined to grow. In anticipation, William Roach and George Organ erected a substantial store building in Auburn in 1852. However, another man named Philip Wineman, who had purchased nearly 200 acres a mile south of Auburn, offered a free donation of land to the railroad on the west side of Sugar Creek. Wineman also laid out a “paper town” to support the railroad, which he named after himself. A fierce struggle quickly ensued between the two factions, but in the end, Wineman prevailed. Though there were no topological barriers preventing the line from passing through Auburn, Wineman had obviously cut a deal with the railroad. 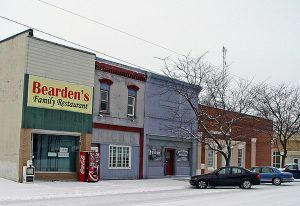 Before long, most of the businesses of the old townsite picked up and moved to the new town, which they renamed “Auburn,” and the old site was then known as “Old Auburn.” Later, as some of the buildings burned in a fire and others were torn down and hauled off, the old site was sold and converted into a cornfield. Situated on the new railroad, the village began to grow. The first merchandise was sold by Ham & Poley, who established their store in 1853. One of the first manufacturing entities was Morse’s Wagon, Carriage, and Agricultural Implement Manufactory, which was established in 1856, eventually employing 20 men. Auburn became an “official” city in 1865. In 1872, the Auburn Bank was organized and two years later, the Auburn Herald (later named Auburn Citizen) began publication and is still printing newspapers today. By the early 1880s, there were eight school houses and eight church buildings in the Auburn Township. The city of Auburn boasted four grocery stores, two dry goods stores, three saloons, two hardware stores, three restaurants, a furniture store, a brick factory, and numerous other small businesses. By 1890, the population had grown to 874 and by 1900, Auburn boasted almost 1,300 people. By then the town was mostly supported by several manufacturing businesses, turning out flour, carriages and farm implements. Over the years, the town continued to develop, welcoming Route 66 travelers when it barreled through in 1926. Today, this town of about 4,500 people provides the advantages of a small town while being only minutes from the State Capitol. A number of old buildings can still be seen on Auburn’s downtown historic square. Turn east on Jefferson Street from IL-4 and continue to Fifth Street. Moving southward on your Route 66 journey, continue on IL-4 to Thayer, just about 3.5 miles down the road. Becky’s Barn at Auburn, Illinois by Kathy Weiser-Alexander. Where did the red brick come from? Curious to know if it came from Fort Scott, KS.